The wife and I visited one of the hottest selling condo projects in 2009 during lunch time today – TREVISTA. As some of you may recall, this project was launched at the end of August 2009. Some 320 of the 590 units in total were snapped up within the first preview day of the first phase launch. Agents were seen armed with blank cheques from clients keen to secure better units and who had given them authorization to book units on their behalf. The developer (Choice Homes) had originally released 210 units, but had to release another batch of 190 units in the early evening to satisfy demand. The price for the second batch was raised by about 2 – 3% from the initial average price of $898psf. But demand remained so strong that Choice Home had to stop issuing queue numbers after 9pm and told those streaming into the showflat site to return the next day. 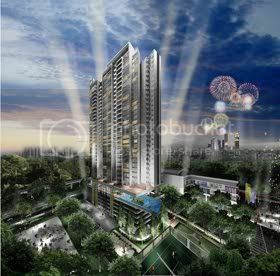 TREVISTA is the first private condo that is launched in the mature Toa Payoh estate since 1996. That was when City Development Ltd launched the freehold “Trellis Tower” at a reported average price of $900psf. TREVISTA is what the wife and I deemed as a “Heartland Condo” project, similar to developments like “Clover by The Park” in Bishan and even “Centro Residences” in Ang Mo Kio. It is located at the intersection of Toa Payoh Lorong 2 & 3, and sits on a 150,000sqft arrow-shaped site with a plot ratio of 4.2. One unique feature of this project is that the ground level is actually elevated by some 4.5m, while the “basement” carpark is really where the actual street level is. The project consists of 3 Towers of 39-Storey each, with a total of 590 apartment units. The expected TOP is December 2012. The main entrance to TREVISTA is located along Toa Payoh Lorong 3, but there is another vehicle entrance/exit at Lorong 2 that is catered to residents only. • A Sky Garden on the 39th floor of Tower 23, where you will supposedly get an unblocked view of MacRitchie Reservoir and the City skyline. • 50 X 12m Lap Pool that looked quite huge in the site model. • Aqua gym, water lounge pool and children’s play pool. • Aroma garden and Spa alcove. • Club house with gym and steam room, 2 tennis courts, golf putting green, basketball practise corner, fitness corner and even a rock climbing wall. • 2 party pavilions where you can do all your outdoor entertaining and parties. In terms of parking, we were assured that one carpark lot will be available for each unit, with some “spares” for second cars and visitors. The total number of lots, however, is still unknown. There are 2 showflats at the sales gallery. The first one is a 1701sqft, 4-bedder unit (Type D1) located at stack #8. No private lift this time, as the 3 common lifts is shared amongst the units on the same floor. The apartment comes with 2.8m ceiling height and 60cm X 60cm marble-slab flooring, and there is a rather sizeable built-in storage space next to the main door as you enters the unit – this we like as one common problem with new condo projects these days is the lack of storage area. The living room is L-shaped, which we find a tad small. This is because the dry kitchen takes up quite a bit of room within the living/dining area. This is one layout that may be better off without the dry kitchen, which cuts part of the living room into half. The wet & dry kitchens are fitted with “Teka” oven/hood/hob/sink, “Hansgrohe” faucets and both top & bottom kitchen cabinets. Those of you that cook frequently may be pleased to know that TREVISTA uses piped gas, so there is no fear of your gas canister running out when you are in the middle of frying that sambal fish. The yard area, where the home shelter/maid’s room and toilet are located, is quite small. This is compensated by a small balcony area behind the wet kitchen, which is ideal for laundry. The main balcony in the living room is somewhat odd-shaped, but is long and wide enough to accommodate an 8-seater long dining table especially if the planter box area is decked up. The common bathroom has homogenous tiles flooring/ceramic walls and “Hansgrohe” faucets. The master bedroom and the 2 common bedrooms are all very decent sized, and come with good quality wardrobes. The master bathroom is also quite big, and has separate shower cubicle/bath tub, “Hansgrohe” faucets and “Bravat” sink/toilet bowl. The junior suite, however, is rather small and faces the west sun (hot!). The other showflat is a 1281sqft, 3-bedrooms unit (TYPE C2), which is located at stack #11 and #12. The unit has a long rectangular living/dining area, with homogenous tiles flooring. A row of bay windows lined the entire length of one side of the living room, while the balcony is on the other side. So there is no lack of natural lighting with this unit. The balcony is again odd-shaped, but large enough to fit a 6-seater long dining table if desired. The unit has both wet and dry kitchen, but no proper yard space for laundry. The home shelter/maid’s room and toilet are located at the end of the wet kitchen area. The master bedroom is decent sized but the 2 common bedrooms seem a bit small. Other than no marble floor for the living/dining area, the furnishing and fittings are somewhat similar to the 4-bedder. • Location, location, location – TREVISTA is supposedly a 3-mins walk to Bradell MRT station, and 5-minutes away from Toa Payoh HDB hub where you will find most of the amenities you need. The surrounding HDB estate also provides you with local supermarts, coffee shops and wet markets (we think!). TREVISTA is also about a 10 -15 minutes drive to CDB/Orchard area via CTE. • As TREVISTA is built on elevated ground, this allows the rubbish collection centre to be concealed in the “basement” level. The rubbish collection centre is located after the main entrance to the left. The rubbish collection trucks go straight into the collection centre, do their job, and then straight out. All these are done behind public eyes, and both you and your guests are spared the ugly sight of pieces of discards lying about as per some condo with external rubbish collection centres. • We are pleasantly surprised by the quality of furnishings we found in the showflats, which we dare say are much better than some of the other projects we have seen (think Meadows @Pierce, for one). • The living/dining room even for the 1701sqft unit is rather small. This is unless you push the dining room out to the balcony, which will then allow you more space in the living room. • Without sounding like a snob, “Heartland condo” like TREVISTA, which is located within HDB estates, may not appeal to everyone. This is despite the comparabe living styles provided by such condominium, and its proximity to amenities available around the matured HDB estates. Thus you may find yourself limited by the pool of potential suitors on the resale or even rental front. • The only primary school we can identify that is within 1-km of TREVISTA is CHIJ Toa Payoh. So no joy for parents with boys. • The 1808sqft, “4-Bedrooms + Study” unit on the 26th floor (#26-09) will cost you $1.625 million (=$899psf). • The 1733sqft, 4-Bedrooms unit on the 21st floor (#21-08) is priced at $1.563 million (=$902psf). • For a 1281sqft, 3-Bedrooms unit on the 28th floor (#28-12), you will have to pay about $1.288 million (=$1005psf). • Monthly maintenance cost for a 4-bedder unit is around $300-350. Apparently, the developer has not released the “per share value” information yet. We feel that the current price at TREVISTA still represents good value, given its convenient location and quality furnishings. As of today, only about 80 units are left – these are mainly the larger 3 and 4-bedder units. We were told by the friendly marketing agent that the “4 + S” units from 20th floor onwards in stack #09 are the best facing, as you get the MacRitchie Reservoir view. However, the wife pointed out that all such units are west facing, so you will also face the full wrath of the afternoon sun. The 4-Bedrooms units above 20th floor in stack #01 are also preferred, as you supposedly get unblocked view from both the front and back of the unit. TREVISTA is also one of the last condo project that still offers the Interest Absorption Scheme (aka Deferred Payment). In summary, we feel that TREVISTA will probably be popular with HDB upgraders, or price conscious buyers looking for good-sized apartments in a convenient and relatively central location. Those interested in TREVISTA should contact Darren Tee of CBRE (mobile: 98238986) – Darren is not related to us in any way. He just happened to be the friendly and knowledgeable marketing agent that served us today. No Comment to " TREVISTA (Review) "